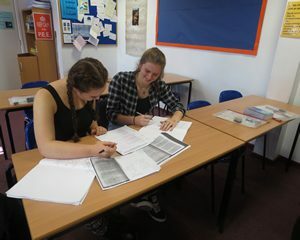 The English Literature A Level is an intensive course which offers students plenty of scope to develop their reading interests, as well as enabling them to develop as informed, independent readers and confident critics of literary texts. The course will improve analysis skills and appreciation of literature by building on the skills and concepts developed at GCSE. 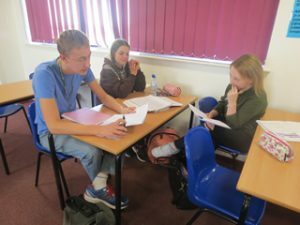 English Literature A Level will give you a good qualification for the world of work, or will help you gain entry into any number of courses at university. Although English Literature is a popular A Level choice at Polesworth, we are able to offer reasonably sized teaching groups which allow for discussion and individual personal attention. Many of the lessons are discussion based and you will be expected to voice your views and opinions on a whole variety of topics. We organise frequent theatre trips and conferences related to the set texts and wider reading texts. Of course, like any other A Level subject, it is also hard work. As a Department we are committed to achieving the best possible results for our students, which is borne out by our excellent record of past grades. With us you can be confident that nothing will be left to chance when it comes to you getting the grade you need. You will study a wide variety of texts, both modern and pre-20th Century. Most of these will be written by English writ ers, although some will be taken from other cultures. You will also be expected to read other works of literature independently to support your studies. Above all, we want students with lively and enquiring minds who have an interest in the world! English Literature is interesting, enjoyable and relevant and a change from your main school experience. So, if you enjoy literature and wish to improve your English skills, make the right decision and join us in September. 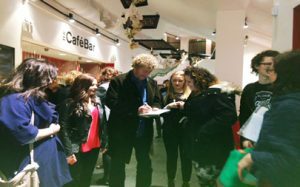 On a year 12 theatre trip, students met Sebastian Faulks, author of Birdsong.